Biographies of most extraordinary and talented peoples of the world. Wasim Akram (born June 3, 1966 in Lahore, Punjab) is a former Pakistani cricketer. He was a left-arm fast bowler and left-handed batsman, who represented the Pakistani cricket team in TestsOne-Day Internationals. He is widely regarded as one of the finest fast bowlers ever and holds world records for the most wickets taken in both ODIs (502) and List A cricket (881). An immensely talented player first discovered by Imran Khan, Wasim Akram played for his college(Govt. Islamia College Civil Lines, Lahore) as an opening bowler and batsman. As a bowler, Wasim possessed genuine pace, accurate control of line and length and seam position, and could swing the ball both in and out. With a very deceptive ball-concealing action, he could bowl equally well from both sides of the wicket. His mastery of reverse swing with the old ball meant he was at his most dangerous towards the end of an innings, and earned him the nickname Sultan of Swing. As well as often being able to find the edge of the bat, Wasim would also focus his attack on the stumps and had a particularly lethal yorker. Of his 414 Test wickets, 193 were taken caught, 119 were taken LBW and 102 were bowled.In partnership with Waqar Younis, he intimidated international batsmen in the 1990s. Together Wasim and Waqar, known as “the two Ws” of the Pakistani team, were one of the most successful bowling partnerships ever. Wasim was also skilled with the bat and was regarded as a bowling all-rounder. He was especially effective against spinners. However, he liked to slog and was criticised for his lack of big scores and giving away his wicket too cheaply for a player of his talent. He did silence his critics in October 1996 when he scored 257, not out, of the team’s total of 553 against Zimbabwe at Sheikhupura. He also made good scores in difficult times for the Pakistan team such as his 123 against Australia and his 45 not-out to take Pakistan to victory in a low-scoring match. Pakistan, needing six runs in two balls two win the Nehru Cup saw Akram come out to bat. The first ball he faced was hit out of the ground and secured the cup. Ahmed Bilal was his coach who gave him tricks on reverse swing. 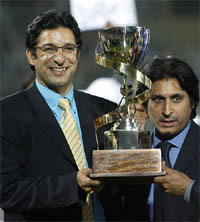 The fifth ODI between Pakistan and South Africa was dedicated to Wasim Akram who retired just after the World Cup. A moment to rejoice for the oppositions all over the world and the way Proteas easily beat Pakistan one could see how Pakistan missed Wasim. But things aren’t forever and as all good things must come to an end, Wasim has finally called it a day. Here’s a piece that I wrote earlier in tribute to the Big W, God’s own left arm. “First of all, convince yourself that you are the best because the rest of your life is gonna go proving this to others” -Wasim Akram, in a T.V commercial. Time and again, I have seen teams fighting back against a Pakistan bowling attack after early setbacks requiring just about one and a half run per ball in the last few overs. But that’s where the party ends-because then the ball is thrown to Wasim and the whole world knows how desperately impossible it is to score at more than a run a ball when Wasim is bowling at the death. Arguably the best bowler at death, his straight late swinging yorkers are responsible for the shortening of most tails all over the world. And who said that with the advent of helmets and protective equipment, tailenders will be able to contribute more? At least not against a Wasim led Pak attack. They say that with age, flair gives way to simplicity; exuberance gives way to soberness and childhood gives way to wisdom that comes with the realization that you have grown old. Flamboyance and age happen to share a negative correlation, but not with Wasim. You have seen him around for about 19 years now, he must be old. He needs insulin everyday, a severe diabetic, he must be really old. And yet, when you watch him take his n hundred and nth wicket, the childish joy on his face makes you believe he is a young debutant who has just taken his first wicket. That’s Wasim Akram for you. Even at the fag end of his career in World Cup 2003, one cannot forget his consecutive deliveries to get Hayden and Martyn. And who could say he is a 37 year old? Talk of Wasim and the mind inevitably goes back to World Cup 1992 finals- England cruising towards a victory and all of a sudden Wasim produces two unplayable balls to dismiss Allan Lamb and Chris Lewis in succession. That was when he was at his vintage best. And that he could produce such deliveries consistently when his team desperately needed those is the factor that sets him aside. What’s similar in Steve Wuagh, Sachin Tendulkar, Brian Lara, and Wasim Akram? We all come to expect the unexpected with them. Hand Wasim the ball when nothing is happening for you and he will bring some magic. It’s a rare breed, this- the left arm pacemen. Come to think of the names and you don’t have much more than Allan Davidson, Gary Sobbers or Bill Voce. But hands down, the best of them all was spotted by one wise man- Javed, ‘The Spotter’ Miandad. In his very first series against New Zealand in 1984-85, he drew comparisons with all the big names mentioned above. In only his second test, he bagged a 10-wicket haul and became the youngest man to do so. And since then, looking behind is one thing he has never done. Now that when he looks into retrospect, he would like to change the 1996 World Cup Quarter Final against India, the 1999 World Cup Final and the supposed match fixing allegations against him. I call these allegations ‘supposed’ because not in my life have I seen him ever give anything less than One Hundred Percent. Yes it hasn’t been all rosy. It never is, for anyone. He has had to take the wrath of a cricket crazy nation and a corrupt administration for every failure of his, no matter how few and far within these failures have come. Add to this the fact that he has taken a majority of his 916 international wickets on subcontinent pitches- dead as dodos, not to forget a long menu of injuries he has fought. The brunt of Akram’s cricket has been borne by his groin and shoulder. His groin was first operated on in 1988 and again two years later. The latter operation was complicated when an adductor muscle separated from his pelvis, leaving his left leg only half as strong as his right: it was restored only by intensive physiotherapy. He first experienced shoulder pain seven years ago, while representing Lancashire, and delayed surgery, only to break down when he tried to bowl a bouncer during the Singer Cup Final in Sharjah in April 1997: there were further operations, a six-month lay-off and a regime of painkillers. Add to this, severe diabetes and fading eye sight. And still he continued till 2003 and stayed among the top few bowlers all through. Nothing short of a medical miracle- Is it? Despite all the match fixing allegations and personal controversies, he still remains the best quick bowler I have seen operate in 20 years of my life. Wasim retired in 2003, after a brief spell with Hampshire in England. Since then, Wasim has taken up commentary and can currently be seen as a sportscaster for the ESPN Star network, and is also running shows on ARY Digital. In his Test career, Wasim took 414 wickets in 104 matches, a Pakistani record, at an average of 23.62, and scored 2,898 runs, at an average of 22.64. In One-Day Internationals, Wasim took a world record 502 wickets in 356 appearances, at an average of 23.52, and scored 3,717 runs, at an average of 16.52. Wasim was the first bowler in international cricket to take more than 400 wickets in both forms of the game, and only Muttiah Muralitharan has since achieved this. Uniquely, Wasim took four hat-tricks in international cricket, two each in Tests and ODIs. He is one of only three bowlers to have taken two Test hat-tricks (the others being Hugh Trumble and Jimmy Matthews), and also one of only three bowlers to have taken two ODI hat-tricks (the others being fellow Pakistani Saqlain Mushtaq and Chaminda Vaas of Sri Lanka). Wasim’s Test hat-tricks are unique, since they were taken in consecutive Test matches in the same series, against Sri Lanka in 1999. Wasim is also one of only two bowlers to have taken both a Test and ODI hat-trick (the other being fellow Pakistani Mohammad Sami). Playing in a Test against the West Indies at Lahore in 1990-91, he became one of only six players to have taken four wickets in an over during a Test match. In Wasim’s case, the feat was not part of a hat-trick, the third ball of the series being a dropped catch, which allowed a single.